Today we’ll be looking at and comparing 6 good quilting sewing machines in order to determine the best sewing machine for quilting. We opted to only consider machines that give you everything you need to quilt out of the box. In other words, at the very least these machines need to give you both a quilting table accessory AND at least one quilting foot out of the box. Our criteria is that you have to be able to do at least basic quilting without making any additional purchases. There are many fine sewing machines in the marketplace today, and this guide will introduce you to ten of them. 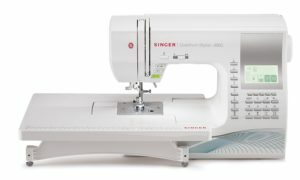 If you are looking for a sewing machine that’s good for quilting, there are certain things that you should be looking out for. The sewing machine that you choose should have the capability of creating FMQ (free motion quilting) stitches and be a heavy duty machine. A wider table is preferred both for quilt making and a quantity of other large projects. It should have a good drop feed, and it should facilitate the stitching of free-form patterns. The ability to do decorative stitches is always appreciated. The most important feature that a good quilting machine should have is the capacity to handle thick layers of fabric. 7.2 How Is Quilting Different From Normal Sewing? 7.4 How Is a Quilting Sewing Machine Different? We’ve decided to cover 4 distinct price ranges in order to give you the best options in each price range so that you can see which machine will suit your requirements without exceeding your budget. We’ll have a nice table for you lower down which compares the features, but first, here are the best quilting sewing machines in the various price ranges. This is the best-selling sewing machine on at the moment. Unlike most other sewing machines in this price range, the CS6000i not only offers you a quilting table accessory, but also a bonus package containing a walking foot, spring action quilting foot and a quilting guide, as well as some basic built-in quilting stitches. If you want to read more about this machine, check out our review here. For now, in summary, you’ll struggle to find better value for the price. This is your best option for an entry-level quilting sewing machine. This is an affordable entry from Singer, although it hasn’t been their most well-received model. It does come with a host of great features, including 98 built-in stitches. Sold specifically as a quilting/sewing machine, the 7469Q features a large extension table and 4 bonus quilting feet: even feed/walking foot, darning foot, open toe foot and 1/4 inch foot, along with a few basic quilting stitches built into the machine. Takes only class 15J bobbins, which some users find restrictive; however it offers a lot of advantages that offset this minor downside. The Brother HC1850 is an exceptional machine with an almost limitless number of special features. 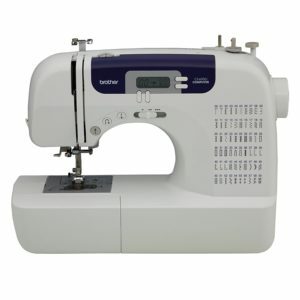 This machine has 8 different styles of auto-size one-step buttonholes, a detachable foot controller, eight specialty feet for blind hems, overcasting, buttonholes, quilting, zippers, and more. It comes with a stitch flip-chart attached, and features very easy, dependable threading of bobbin and top thread for high-quality, consistent stitching. If the 7469Q was one of the less popular Singer machines, the 9960 Quantum Stylist is quickly becoming a consumer favorite. 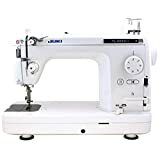 This is an overall fantastic sewing machine loaded with features (600 built-in stitches, 13 one-step buttonholes, 5 fonts, electronic auto-pilot and more). Here’s what it offers the quilter out of the box: in addition to the extra-large extension table, you also get an even-feed/walking foot, darning and embroidery foot and an open-toe foot. There are also some basic quilting stitches built in. 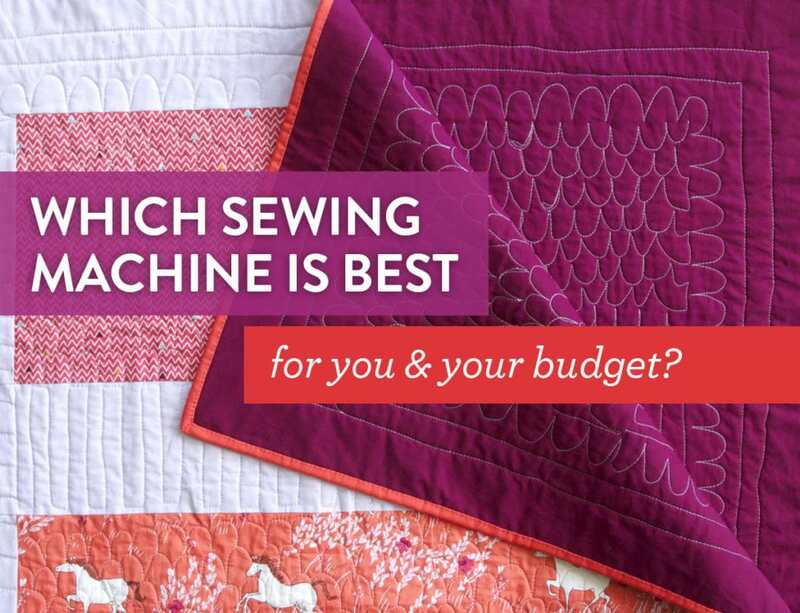 In other words, you’re well covered for quilting, while getting a stunning sewing machine to boot. The Brother PQ1500SL strikes a nice middle ground between the heavy duty professional segment and the casual home user segment. This is a blisteringly fast straight stitching machine, with a maximum speed of 1,500 stitches per minute. To maintain that speed without falling apart you’d expect this to be a finely constructed machine, and it is. It features a comfortably large 12×18” extension table, a knee lifter to free up your hands while quilting among a host of other features. This machine has been a wonderful tool to complete the quilt tops that have been UFO’s for some time. I love this machine’s power and speed also the needle threader and auto thread cutting button. The stitches are so perfect and the walking foot does such a wonderful job. The adjustable foot pressure and easily adjusted tensions are great, dropping the feed dogs is as simple as turning a dial; I’m very pleased with the overall performance of this lovely machine. 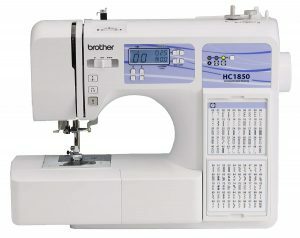 The Brother PQ1500SL also has a needle down action which is excellent for patchwork. I have other machines that I have in use all the time for sewing, embroidering and quilt top piecing but when it comes to the final stage of putting it all together I cannot recommend this machine highly enough. The Brother PQ1500SL sewing/quilting machine has a pin piecing action that is producing good results in the moving together of the two fabrics being joined; no fabric slipping. It comes with a large extension tray; very useful for freemotion quilting. There are several feet for other straight stitch sewing including two hemming feet, 1/4 inch foot, free motion foot and invisible zipper foot etc. Straight stitching is all this machine is capable of doing, however at 1500 stitches a minute it makes short work of big quilts. The throat is large and there is plenty of room for even the largest quilt to be manoeuvered around easily. The only down side I have found is that the lighting could have been better. The Juki TL-2010Q Lockstitch, One-Needle, Portable Sewing Machine offers a high-quality automatic thread trimmer for tailoring, quilting, home decor, and apparel. This quality machine has a throat area of 5.9 (H) inches x 8.5 (L) and is recommended by quilters, who claim that this machine makes the finest straight stitch, and promise that it can handle a king-sized quilt easily. This machine has a good knee lifter and presser foot pressure control, a side loading bobbin, and gives the sewer the ability to use either cones or large spools of thread. It sews extremely well, even on thicker projects, and it’s easy to adjust. Sewers should be sure to oil this machine frequently, as per the manufacturer’s instructions. Take care of this machine, and it can last a lifetime – it’s sturdy, quiet, dependable, and quick. Simply put, quilting refers to the process of sewing several layers of material together so that the resultant structure is a thicker and warmer cloth. A typical quilt consists of three layers. The first is the quit top. This is where you put your design. The second layer is the wadding. It acts as a padding for your quilt. Finally, we have the backing which holds the wadding in place. Just like normal sewing, there are various types of stitches used to quilt the layers together. However, the basic running stich is the easiest and most common. So you may want to start with that one. FYI, you can either do hand or machine quilting. But today we are only going to focus on the latter. How Is Quilting Different From Normal Sewing? Sewing is a pretty straightforward concept. It refers to the process of joining fabrics together using thread. From the definition of quilting (given above), you can see that quilting is a type of sewing because it involves joining fabrics together in a sandwich-like manner. So we can say that all quilting is sewing, but not all sewing is quilting. For your sewing to be quilting, there must be at least three layers of materials joining together. There are three types of quilting sewing machines: long-arm, mid-arm and short-arm. They are categorized and named based on the size of the arm. The arm is the top horizontal casing of the machine (the distance between the vertical part on the right and the needle on the left). Therefore, it follows that a long-arm quilting machine has the longest frame. It measures anything from 10 to 14 feet in length. As a beginner you don’t need that. In fact most of them are used for industrial purposes. Mid and short-arm machines feature an arm that measures 9 to 12 inches long. While a short-arm has a throat space that is about 7 inches wider than the conventional sewing machine, a mid-arm features an even wider throat space than a short-arm. Both are great picks for beginners but a short-arm is the least expensive. It makes more sense to pick that one as you perfect your skills. How Is a Quilting Sewing Machine Different? A best quilting sewing machine for home use should have a long arm which is used for sewing together quilt batting, backing, and a quilt top into a finished quilt in significantly less time than more traditional machine-quilting or hand quilting. A longarm sewing machine features a work table, sewing machine head, a few fabric rollers, plus a metal frame. 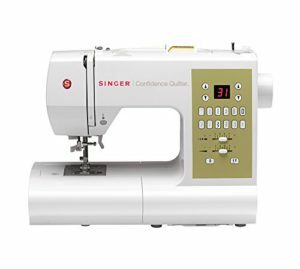 A quilting sewing machine should also have a large frame, medium or large size bobbins, specific quilting feet, ample lighting, auto thread cutting, and minimum workspace of 9″. 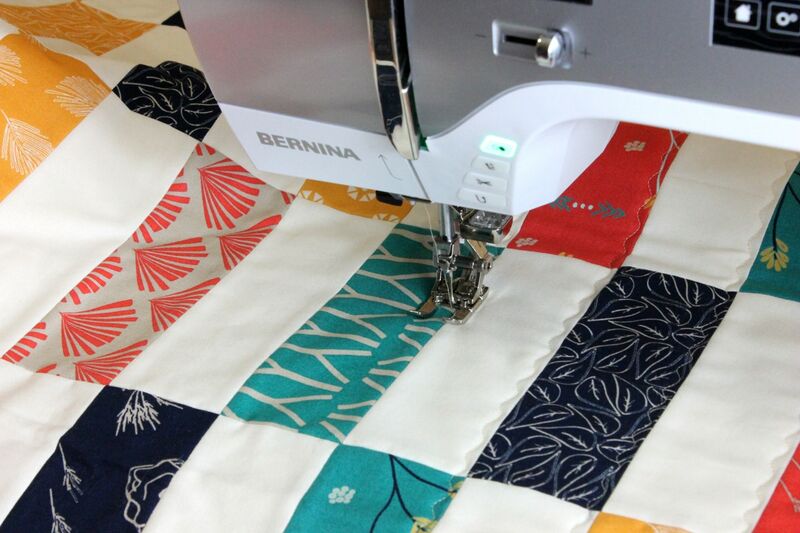 Many of today’s quilting sewing machines offer free-motion quilting instead of a long arm. Quilters should make sure that their batting and backing are at least 2 inches larger than their quilt top on every side, and use basting spray before starting to FMQ (Free Motion Quilt). Beginning quilters should look at the lower price range for devices – either under $200 or in the $200 to $600 range. They will need a machine that will backstitch, do multiple stitches, and have ample lighting. Other features that are important for a beginning quilter are a start/stop button, a needle down position, and a full throat ( that’s the space in between the machine and the needle) to be able to hold the bigger quilts. A beginner machine should provide high quality, uniform stitches, simple electronic buttons instead of levers and dials, and access to a wide variety of decorative as well as useful stitches. Expert quilters need a variety of options from their quilting sewing machines. First and foremost, their machine needs to have both a long arm and long throat to accommodate advanced quilting. They must have a machine that is both wider and deeper. Expert quilters need to have many customization options, including various font and embroidery options, and a high number of stitching combinations. They need the ability to be able to change stitches in midstream, a strong thread tension that can stitch through at least four layers of material, and a free arm so that they can use their patterns. Expert quilters also need adjustable stitching width so they can create unique designs, a top loading bobbin, a clear base (if possible) plus a fully automatic needle. They will appreciate having a full horizontal rotary hook, computer access to a wide variety of patterns and fonts, touchscreens, good lighting, quality FMQ, a broad range of accessories, and an excellent layered fabric-feeding system. 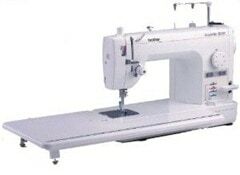 Overall, for a combination sewing/quilting machine, we recommend the Singer 9960 Quantum Stylist. 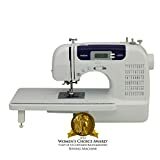 Its brilliant collection of features, wonderful price, quilting accessories included and great customer reviews easily swings it as the best quilting sewing machine for the intermediate to semi-professional user currently available.